Digging in the archives here at 1967beetle.com, we wanted to put this fantastic article in the spotlight once again. Brian, tell me a little about yourself and how Finish Your Plates began? Well, I’m 34 years old and a single dad of a ten year old daughter. Finish Your Plates is my full-time job. I have lived in Tennessee all my life, the Chattanooga area for roughly 24 years and in Cleveland the last ten. I started restoring plates in 2006 after selling off a bunch of stuff on eBay I had no use for. I discovered the popularity of vintage plates at this time. I was very amateur in the beginning and for years to come, nearly all the way through 2010 before a great breakthrough in quality came. I gave up on it by late ’07 and even tried to sell my equipment on Craigslist. Thank God no one bought it! The equipment is pretty affordable but I would have totally forgotten and not messed with plates anymore if I had sold it. I created Finish Your Plates in late ’08. I had an unsatisfying job like all the previous ones and no college education, so I pushed marketing Finish Your Plates as heavily as I could. Life was tough. I always wanted to do my thing. I lost my job in Feb ’09 and collected unemployment for the next two years (first time in my life to collect unemployment), all while marketing Finish Your Plates (less than 1% of my business is local here in TN). I also had no vehicle during this time. I had nothing else to do since jobs weren’t available. Thankfully all the supplies I needed for plates were within walking distance at the time. I needed this to work once the unemployment ran out. So here I am, a little 1 1/2 year later from the end of that. Six years since my first plate. Best it’s ever been. I love what I do. Best job I’ve ever had. It’s very rewarding too to see all these classic cars with my work on them. 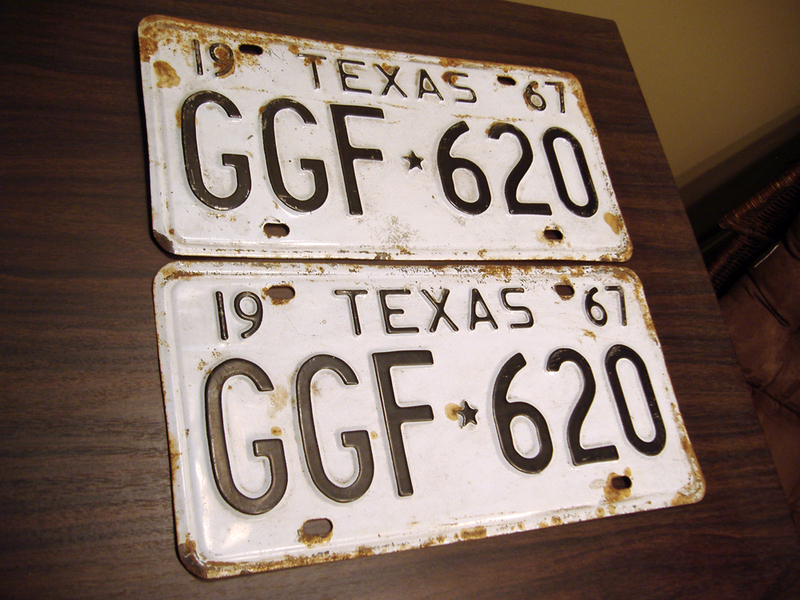 Why vintage plates, VS doing restoration work on any other early car part? I don’t know really; the plates just stuck. I figured I should focus with one thing. 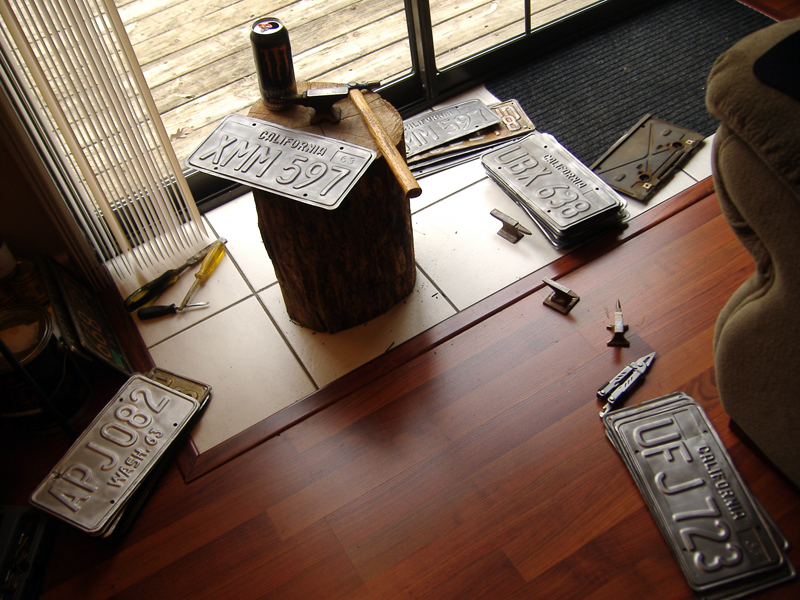 Plates can be applied to any vehicle VS a particular car part that is for one type of vehicle. So I have something the entire classic car industry needs. Whether it be a domestic or foreign car, truck, motorcycle, etc. The market is massive and in demand in other countries too. 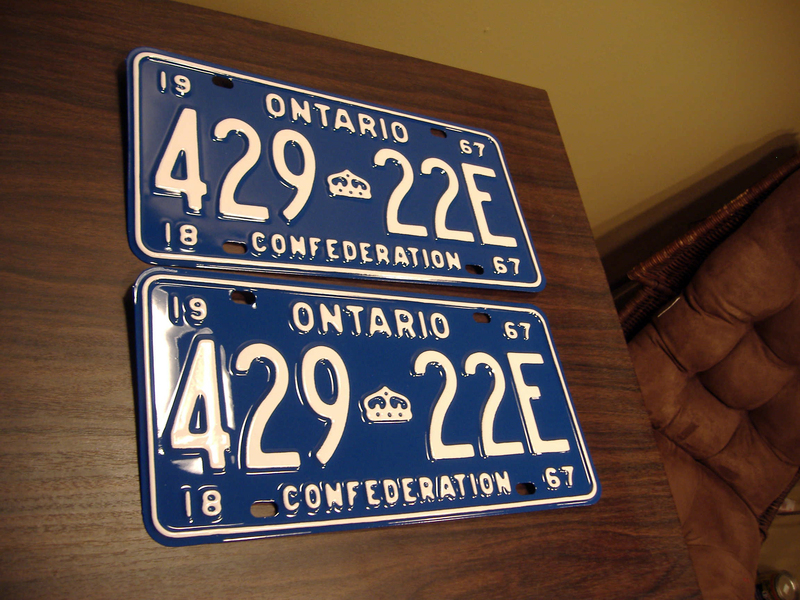 Canada and Australia are great doing business with and have really cool plates. So I guess for now, plates will be my gig. It probably will be for a while. Talk to me a little about your process. Where do things begin once you receive a plate that needs restoring? The owner is first notified of the arrival of the plates. If any major damages are present like cracks or extra holes, an estimate will be given for repairs. The plate gets stripped of all paint before blasting. Next any metalwork is performed. I can do all types of metal repair, but plates that looked like they’ve been buried in the ocean for the last fifty years are not something I mess with. After metalwork is done, plates are primed and sealed then painted their base color, whatever that may be. The lettering is done last, by hand. Some people shun the idea of doing this by hand but with the right tools and paint, you can get a professional result. Without those things, you can only expect amateur type results. These are some of those ‘trade secrets’ as they are vital to the business. 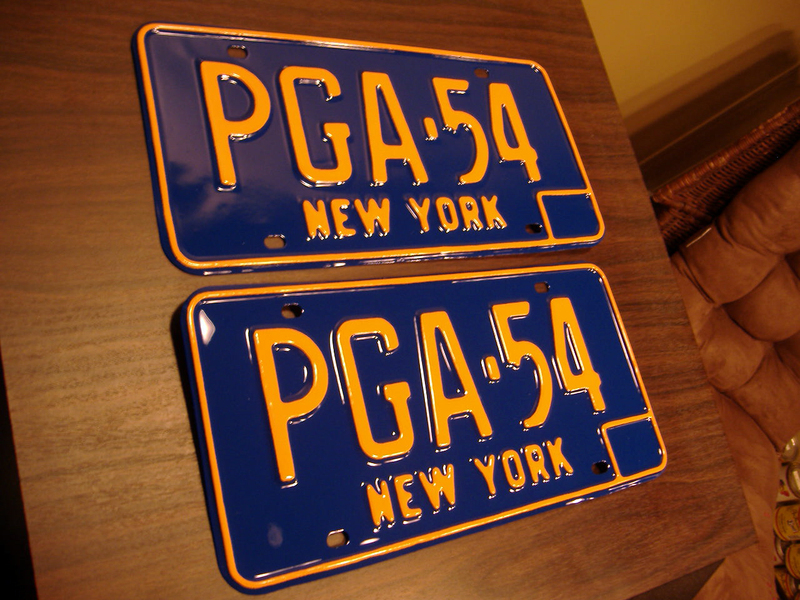 Pictures of the plates are emailed to the owner, payment is received and out they go! After a few days of drying of course. I would have to say, seeing packages in the mail, the day they are considered finished, getting paid and then an email from the owner with the plates on their classic car. All in that order. I enjoy comparing before and after photos to see the transformation. Seeing the plates on the rides is very rewarding for me. Most people say’ thank you so much’ and that’s the last I hear. But some go out of their way to get photos to me and it greatly appreciated here. 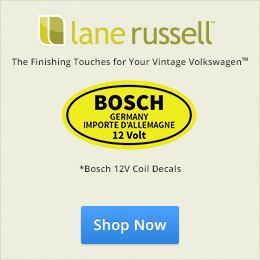 VW, Porsche, Alfa Romeo, Ford Model T and Model A, muscle cars from all domestic automakers from the 60’s. I’ve seen many!!!! Finish Your Plates is not biased and caters to all automakers. What are some of the restoration challenges you often face? Hmmm, that’s a tough one. The process of learning how to get the restoration right and up to a professional standard wasn’t easy for years. Now that I have it figured out, I guess just balancing my own personal life is the most challenging. I tend to be a work-o-holic. I could work endlessly and still have work when I get up everyday. Very thankful for that. The challenges in the restoration process are over! It’s not hard anymore. It just takes a little patience. Currently, I usually have around 40-50 plates a month. Sometimes 50-75. There never really is a ‘slow season’ around here. January tends to be the slowest month of the year but that’s it. Yes I do. Right now, mainly California, Texas and New York. I don’t do much 70’s stuff right now. All fully restored and DMV clear, always. 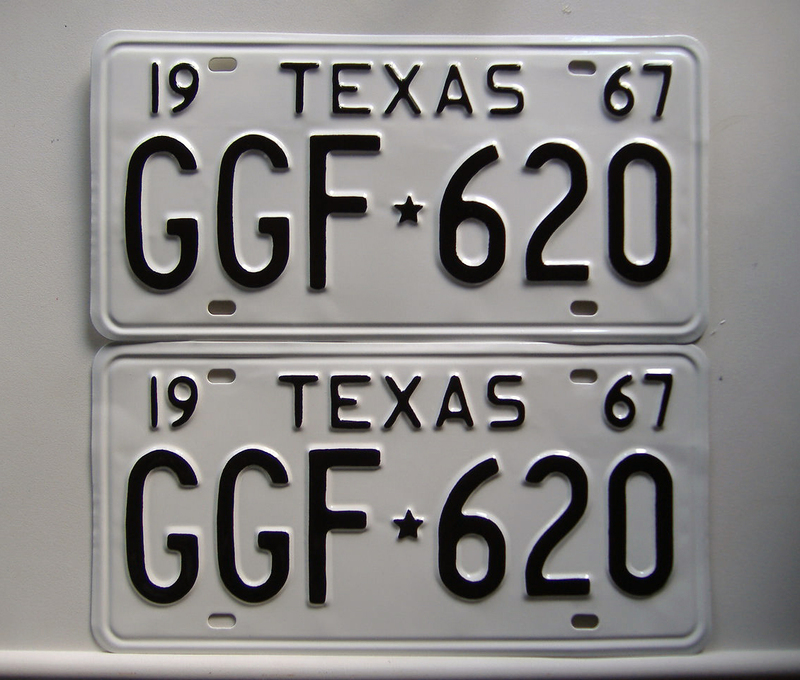 Occasionally I have truck plates but usually just keep passenger vehicle plates in stock. What are some of the more commonly asked questions you receive? Completion time. I keep that at 6-8 weeks too. I do get them done sooner sometimes but that is a safe window for me. That’s the most common question around here really. What are your futures plans for Finish Your Plates? Growing the numbers I guess. They have changed alot over the years. I think I will do this for a while but I have other things I would like to try my hand at one day. Who knows? Maybe one day, all the rights to the website and internet prominence will be up for grabs. It’s just a one man show here. With many others working, this could be much bigger. Haven’t taken that step yet. Maybe I will? We’ll see. By visiting finishyourplates.com or by calling by me at 423-716-8094 before 10 pm EST. I also have a Facebook page under Finish Your Plates. Just started it up this year and it’s a good way to keep up with current restorations and what’s available in my inventory as well. 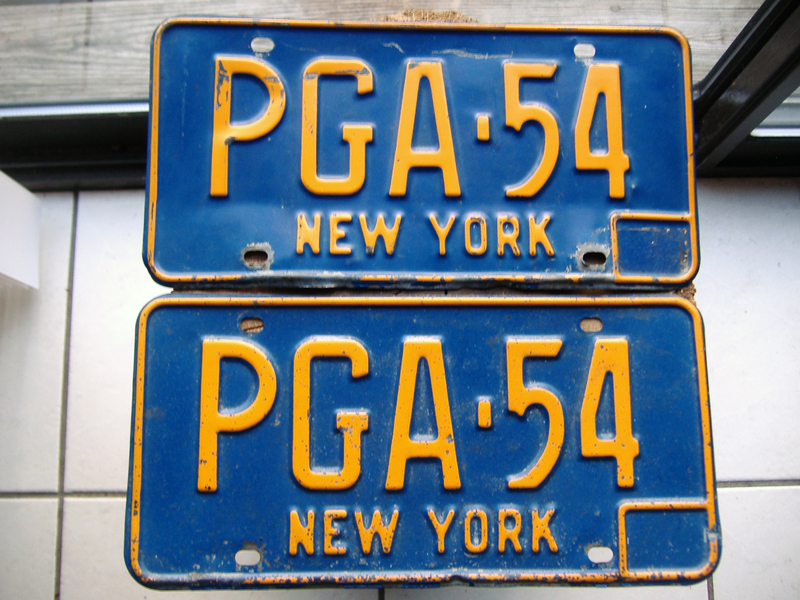 I have good references for those who need ’67 stickers in California and New York. 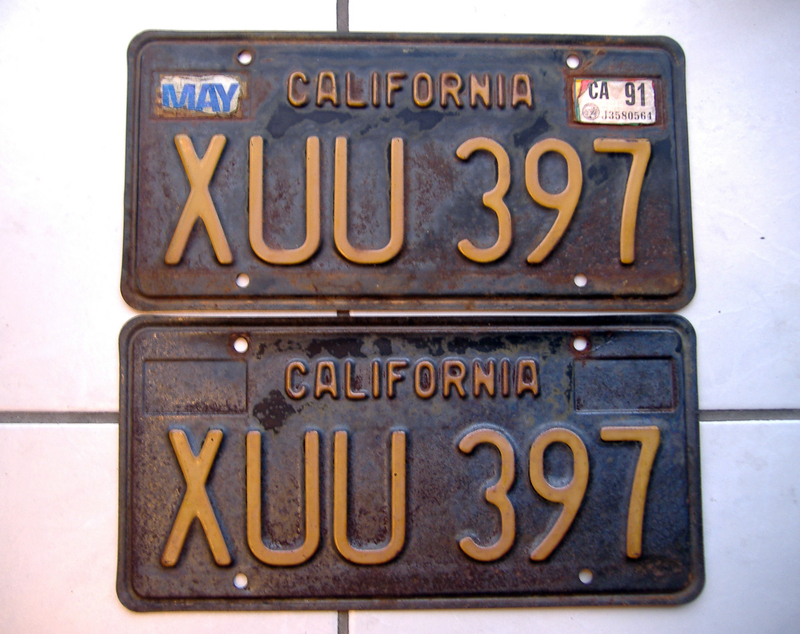 They are required in California in order to register a set of black plates. I don’t sell them but have solid connections with those who do and are reliable. Previous: Previous post: Should I Purchase a ’67 Beetle? Thank you again so very much Mr. Shoemaker. Great working with you! Great article, Eric. There’s one thing I don’t understand about the stickers, though. I had a ’59 with yellow and black plates.and had to put a little metal tab with a sticker on it. 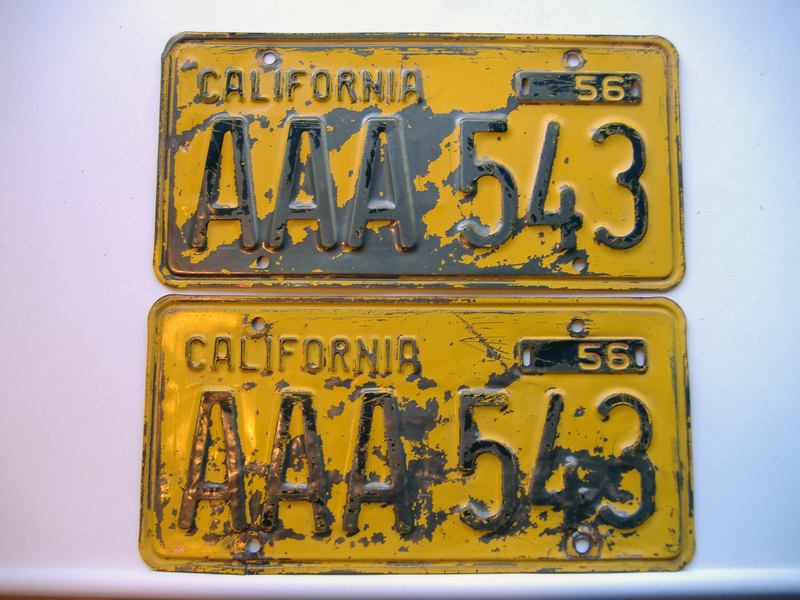 My ’67’s original black and yellow plates just have the regular month and year stickers. Why is anything else necessary and who would know the difference? Also.. Give this a read. Well.. With a ’63 plate (Correct for a ’67) the DMV requires you to have a correct ’67 decal to register. Often times, people don’t want to put the new decals on the plate so…. The DMV sends these metal tabs you can use. It’s either or really. Is that only if you convert to black/yellow plates? I’ve just renewed my registration every year and put on the “year sticker” they send me. The ’67 sticker was long gone years ago. 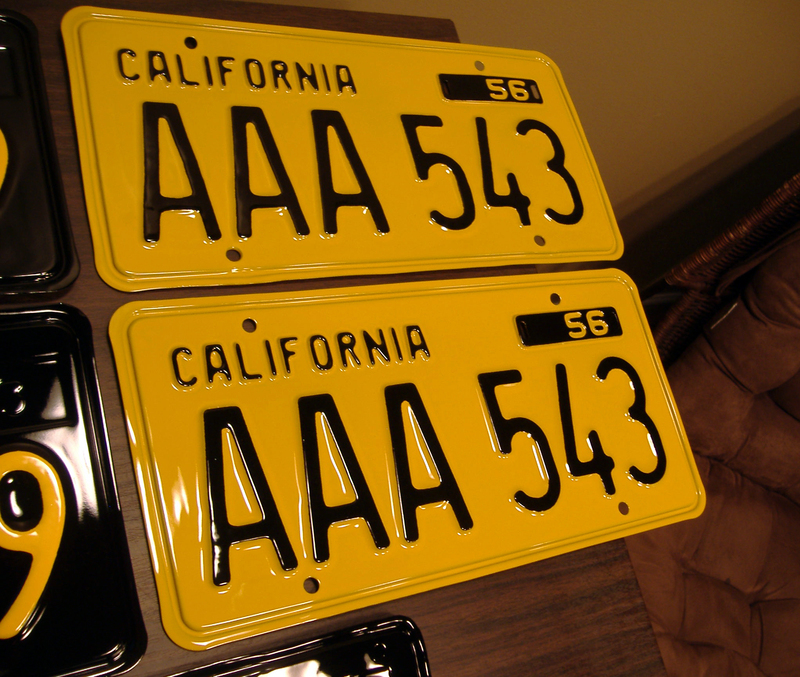 I’ve also seen cars at shows with 7-digit black/yellow plates, obviously painted white/blue plates. 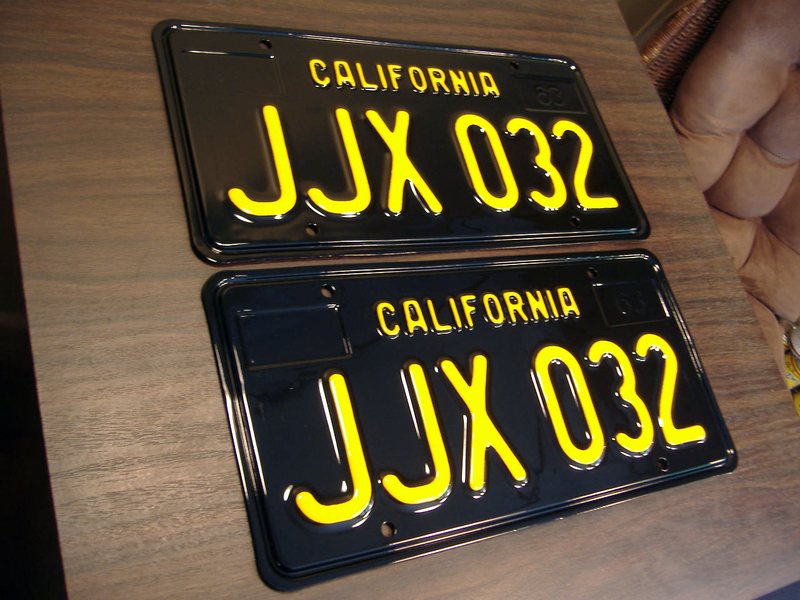 I just received my California Black plates back from Brian. They are perfect, absolutely perfect. Worth every cent I paid! Just sent him a request, thanks Eric! dude! Awesome article and great little business he has there. Wish we could post photos here. 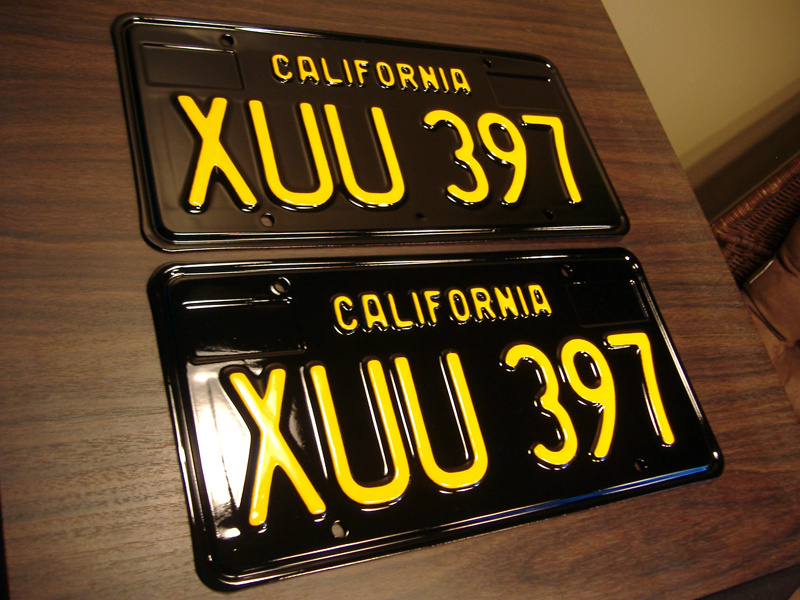 Just got my YOM (Year of Manufacture) plates back from a local restorer here in NW Washington. 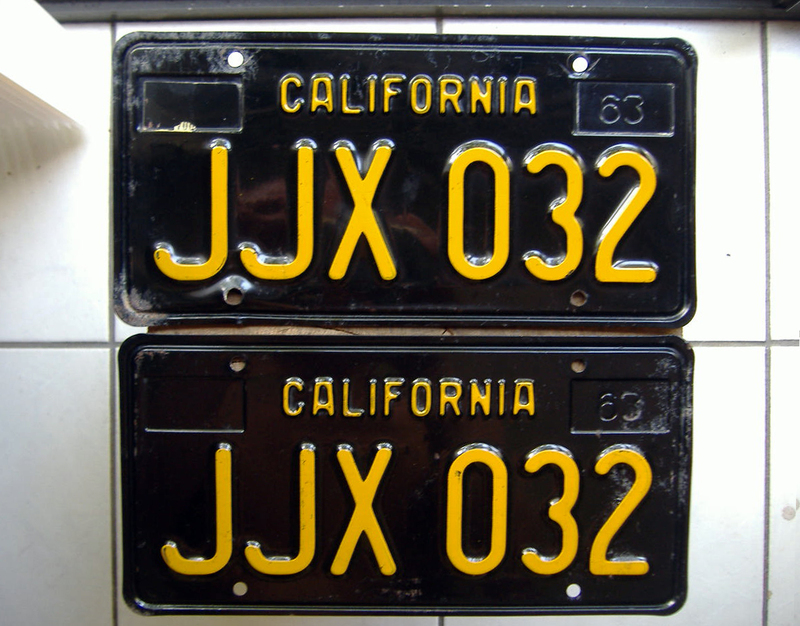 Not only is it a correct ’67 WA plate, it’s one of the few issued from San Juan County which reads SJC 121 … a rare find indeed. You can, actually. Or, you can post in the forum. That might be fun to see plates Brain has done.